Can Volleyball Fight Crime? East Palo Alto Says, 'Game On' : Shots - Health News A California city with a crime problem — shootings, drug dealing and gang activity — finds that getting more kids and cops playing sports together regularly in the park can make a big difference. In a FIT zone at Bell Street Park in East Palo Alto, Calif., friends from the neighborhood now gather regularly to play volleyball. Sia Kailahi is a tough-looking amateur boxer with dark eyeliner and tattoo-covered arms, but today her boxing gloves are off. She tosses up a volleyball and smacks a serve over a net. A dozen people, laughing, keep the ball airborne at Bell Street Park in East Palo Alto, Calif. The park sits right next to a freeway exit in a city that has significant crime, despite being surrounded by affluent communities and technology companies. This park has a history as an easy stop-off point for buying and selling drugs. 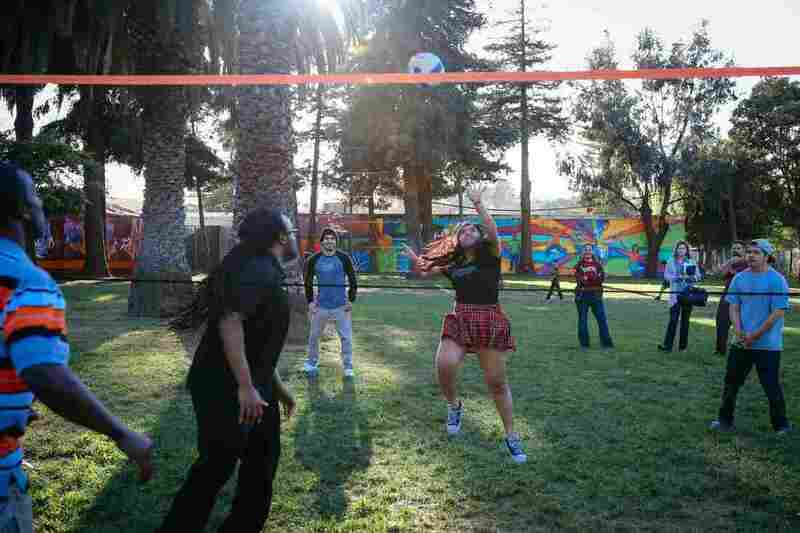 But the visibility of the park may also be a reason the volleyball games here have helped reduce shootings in the area, according to a report from the University of California, Berkeley's Warren Institute on Law and Social Policy. These are not just pickup games, but part of East Palo Alto's FIT zones. The acronym is short for Fitness Improvement Training, but the program is equal parts community building and public health. "I think people in the community can really appreciate us being out here making our city look like a livable place," says Kailahi, from the sidelines. In 2012, the East Palo Alto police department started FIT zones in the places with the highest concentration of gunshots. Researchers had used data from ShotSpotter, a gunshot detection system, to select the sites. "The overall idea," says Melvin Gaines, who manages special projects for the city and has been with the project since it started, is for "residents to overwhelm the negative activities with positive things, so bad guys don't feel comfortable." With police officers providing security, community members began riding bikes here, playing soccer and volleyball, and taking free nutrition classes from the staff of a nearby health clinic. Participation grew over time, and today dozens of people show up three times a week at different East Palo Alto parks. "We found that there was a statistically significant decline in shootings after the introduction of FIT zones," says Sarah Lawrence, director of policy analysis and program evaluation at the Warren Institute. "There is a huge potential for this type of initiative." When Lawrence and her colleagues compared FIT zone sites with neighborhoods with similar demographics over 17 months, they found that shootings were at least 27 percent lower in the FIT zones. But the shooting reduction was not uniform within the FIT zones. Shootings decreased significantly around one site — Jack Farrell Park — but not at Martin Luther King Jr. Park. The study does not explain why the intervention worked in only one of the parks, but Lawrence thinks their locations within their respective neighborhoods may offer a clue. Jack Farrell is central to the neighborhood, and open, so anyone walking by can see cops and kids playing together. Adding team sports and community-building activities to this park didn't reduce shootings, researchers say. They suspect the park's remote location and obscured sightlines might be one reason. King park, by contrast, is so hidden that the city has put up a half-dozen signs with arrows leading visitors through the neighborhood to the park. The entrance is at the end of a cul-de-sac, and most of the park faces San Francisco Bay. That makes it harder for residents to notice that more residents and police are now using the park. Beyond reducing the number of shootings, FIT zones are also about improving health. "We know that communities like East Palo Alto suffer from high chronic disease rates, as well as high crime," Gaines says. "Assuming people are less active in East Palo Alto out of fear, we asked, 'Can we do something that addresses both?' And the answer was FIT zones." Lawrence credits the city's police chief at the time, Ron Davis, for implementing the program. Davis thought the police department had a role to play in the health of residents, Lawrence says. "He is a visionary guy." In East Palo Alto, shootings are still dropping, and people at Bell Street Park say that a safe place to play has helped them improve their own health. A 14-year-old girl named Paluteia is here playing volleyball after rock-band practice. "A lot of my family is overweight," she says, but "seeing other people work out — it's motivating. I can do more, and there are other people who will do it with me." "When I started, I was 397 pounds," says Smokey, another regular at the game. "I weighed myself last Saturday, and I was 332 pounds." 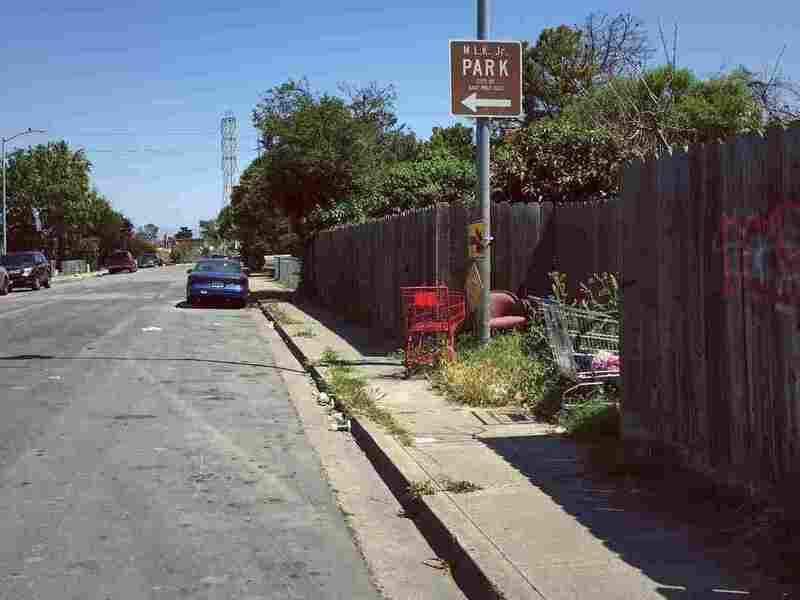 Overall, health indicators tend to be much worse in East Palo Alto than in the surrounding affluent cities. Life expectancy is 62 years — 13 years under the San Mateo County average. Half of all kids in East Palo Alto are overweight or obese, compared with 34 percent in the rest of the county. For some, FIT zones are an opportunity to interact differently with police, in a community where mistrust is common. "In a dark place," said Kailahi, "I could be scared of them, and they could be scared of me — we don't know each other. But we're in the light; we're saying hello." The police are "just like regular people," says Carl Mitchell, a high school student. "They come play games, they mess up, they do good. At least while they're here, they're acting good. Let's say that." The cops' attitudes may also be changing. "I've really seen a shift in the police officers' perspective," Lawrence says. When the program started, she interviewed participating officers. "I asked why they were doing it, and quite frankly a lot of them said, 'I'm getting paid to exercise.' "
"Now," Lawrence says, "those same officers are saying, 'These are my kids,' and really taking ownership." Brian Lee, an East Palo Alto police officer, struck up a conversation with a 5-year-old boy who was poking at a dead opossum during a FIT zone event. As they were chatting, Lee realized, "I knew his dad from the streets. He was a known drug dealer." The boy's father had been murdered on Michigan Avenue, next to Jack Farrell Park, the same block where Lee and the boy now both ride bikes. "I had personally taken his dad's homicide report," Lee says. Lee has his own kids, so he could appreciate how sharp the boy was for his age, how bright a future he could have, given a chance. "Imagining this child's future," Lee says, was "one of the most powerful things I've felt."